PREPARING FOR THE CYBER SALE ON tPt! Tales of a First Grade Teacher for hosting the Linky Party, a fun way for sellers to help each other and get acquainted! All of the products in my store will be 20% off, including the new ones I will be uploading this weekend! I can't wait to share the new bundle of winter literacy activities I've created titled "Warm Up With Writing and Word Work! Love that alliteration! Be sure to add things to your wish list so that you are ready to shop with the CYBER promo code! 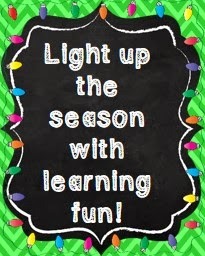 Let's light up the holidays with learning fun! Click on the festive button below to go directly to my tPt store! You are most welcome, Jessica! I am working diligently on a fun and standard-aligned bundle of word work and writing activities for my store in hopes of getting it done in time for the BIG SALE! Have a lovely holiday!